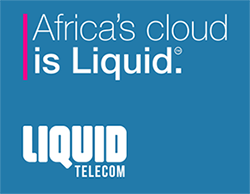 Pan-African telecoms group Liquid Telecom is extending their VSAT service through a new partnership with Kymeta, enabling the company to deliver enhanced satellite mobile connectivity across Africa. 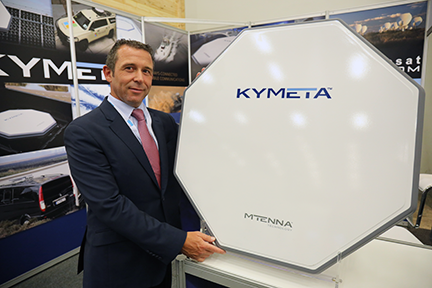 As part of a master distribution agreement announced at AfricaCom 2018, Kymeta’s lightweight, high throughput satellite communication systems will be integrated with Liquid Telecom’s satellite connectivity. This will provide high-speed bandwidth mobile internet access to private and public-sector organizations that would normally have difficulty accessing reliable, affordable internet, particularly in remote locations. Scott Mumford of Liquid Telecom with a Kymeta dish during AfricaCom 2018. Quick and easy to deploy, this modern satellite connectivity offering has the potential to enable new service innovations and transform society in the most under-serviced and remote parts of Africa. Mobile medicine or healthcare vehicles, for example, will be able to deliver screening and remote diagnostics to isolated communities across the continent. It can be used by aerospace, maritime and ground transport customers to create new services and connections across isolated areas and can also support the growth of IoT capability across a range of vehicles to support a fully connected automotive future including self-driving cars. Scott Mumford, Group Managing Executive, Satellite and VSAT, Liquid Telecom, said that this new strategic partnership between Liquid Telecom and Kymeta marks a disruptive moment in the evolution of VSAT services for the African continent. By pairing the latest Liquid VSAT internet platform with Kymeta’s groundbreaking satellite terminals, the two companies are bringing unrivaled connection quality, speed and availability to people on the move and in places that have never been connected before. Neville Meijers, CCO, Kymeta, noted that this new satellite mobility partnership offers limitless opportunities for communication and collaboration in Africa. This mass market broadband platform can be deployed quickly and easily without skilled personnel — delivering Gigabit connectivity instantly and anywhere. Applications of all types can benefit from this future-facing technology: from new digital IoT services in connected transport systems, to healthcare applications and education systems.